Simmons Beautyrest Black Calista and a Latex Topper for a large man with herniated discs. Home → Mattress Protectors → Danican Waterproof Mattress Protector → Simmons Beautyrest Black Calista and a Latex Topper for a large man with herniated discs. My husband suffers from 2 herniated discs and one tear, the mattress we currently have is a soft top and seems to be making matters worse. Could you please make a recommendation for him with support he needs? He is a 6’4 man and weighs 250 lbs. Also, I wonder about the latex toppers and if that is a good choice, if so soft, medium or hard? Thank you so much for your time, money is not a problem if we can help him wake up without severe pain everyday! A soft sleeping surface is not usually the problem. It’s too great a depth of softness, as is provided by so many of today’s mattresses. He does need firm support, but a soft latex topper is there for the comfort, not the support. 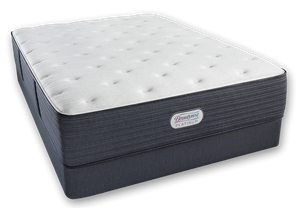 Starting off with a mattress that provides the correct support is step one. The 2″ soft Talalay latex topper you add for comfort and longevity. The Simmons Beautyrest Black Calista is one of the best choices for him, providing plenty of firm support for his herniated discs. The Black models use a triple strand wire that is strong enough to support his weight. Here are links to that mattress and to the topper. A Soft Mattress to Replace an 18 Year Old Pillowtop. A Mattress Delivered to Canada.